For the first time, high-resolution images show the three-dimensional structure of massive ice deposits on Mars. 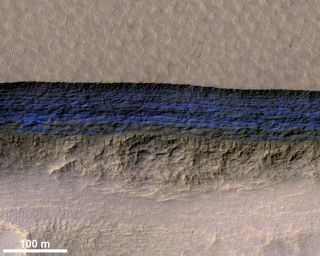 This photo by the HiRISE camera aboard NASA’s Mars Reconnaissance Orbiter shows a detailed subsection of an icy scarp on the Red Planet in enhanced color. Sizable deposits of water ice lurk just beneath the surface in some regions of Mars, a new study reports. The newfound sheets appear to contain distinct layers, suggesting that studying them could shed considerable light on the Red Planet's climate history, researchers said. And the ice is buried by just a few feet of Martian dirt in places, meaning it might be accessible to future crewed missions. Dundas and his colleagues analyzed photos captured over the years by the High Resolution Imaging Science Experiment (HiRISE) camera aboard NASA's Mars Reconnaissance Orbiter (MRO). They identified eight locations where erosion had exposed apparent glaciers, some of which extend 330 feet (100 meters) or more into the Red Planet's subsurface. These sites are steep, pole-facing slopes in Mars' midlatitudes, between about 55 and 60 degrees both north and south of the equator. The ice-harboring areas sport few craters, suggesting they're quite young, geologically speaking, the researchers said. This high-resolution HiRISE image shows an icy scarp on Mars in the context of a broader area. "There've been suggestions that, when there's high obliquity, the poles get heated a lot — they're tilted over and pointed more at the sun, and so that redistributes ice toward the midlatitudes," Dundas said. "So, what we may be seeing is evidence of that having happened in the past." But the newly analyzed HiRISE data give researchers more detailed looks at such deposits, Dundas said. "The take-home message is, these are nice exposures that teach us about the 3D structure of the ice, including that the ice sheets begin shallowly, and also that there are fine layers," he said. The new study was published online today (Jan. 11) in the journal Science.